Need discounted travel packages or discounts on travel accessories and other needs for your trips, then visit the Travel Sale Fair 2018! The annual Travel Sale Fair is expected to be more impressive this year than the previous years with the entry of Smart Communications as partner for the event. Supported by the Philippine Tourism Board (PTB), the event is co-sponsored by Citibank. Happening on October 12-14, 2018, the travel and lifestyle event will be participated by airlines, travel and tour operators, hotels, resorts, travel gadgets, cameras and accessories. Participating companies and businesses are expected to offer exciting travel deals. During the Smart Travel Sale, Smart will also introduce pre-booking feature for their roaming packages. Visit Smart booth at the event to get 50% discount on Smart data roaming products and enjoy worry free getaways in 153 destinations. This will also allow you to share your adventure with your loved ones or friends. The Smart Travel Fair will be held at Halls A-C World Trade Center, WTCMM Building Gil Puyat Ave. Extension Cor. Diosdado Macapagal Blvd., Pasay City. Travel Sale Dates: The sale will be held on October 12-14, 2018 from 11AM to 9PM. As per announcement by the Organizing Committee, the travel sale event will be participated by airline companies including Philippine Airlines, Air Asia, Airswift, Skyjet, Japan Airlines. Taking part in the travel fair are cruise ships and shipping lines like 2Go Travel and Royal Caribbean Cruise. Among the hotel and resorts participating are Eskaya Beach Resort and SPA in Bohol, Two Seasons Resort Boracay & Coron, BE Resort Mactan, Hennan Resort and Tugawe Cove Resort in Camarines Sur and a lot more. Joining the sale are travel agencies and tour operators like Rakso Travel, JTB, Klook, Trafalgar Tours, Travel Now Asia, Blue Lagoon Travel Adventure Travel & Tours and more. Ocean Adventure, Enchanted Kingdom, CML Beach Resort and Waterpark are also part of the Theme parks participants in the Smart Travel Sale Fair. Come to the site of the travel event early to get the best deals. Plan your travel itineraries ahead. Decide where you want to go for vacation with two to three options. Also, be ready with the passenger details and personal information. Identify your budget for your trips. Search online the rates of the hotels or resorts in your travel bucket list. Look for promo fares and discounted travel packages during the Smart Travel Sale. If you come in a group, it is advisable that each travel buddy check different booths for their travel promos and compare. Book sale tickets and cheap accommodations for your chosen destination. Buy discounted luggage, travel gadgets/ accessories and visit Smart booth for discounted data roaming products. Don’t forget to bring a valid ID when you want to book for local trips and your passport for international travel booking. Book domestic promo tickets to Bacolod, Batanes, Bohol, Boracay, Cebu, Coron, Puerto Princesa, Davao, Iloilo, Masbate and other local places. Among the international destinations where you can book for your getaways are Hong Kong, Cambodia, Myanmar, Thailand, Korea, Hawaii, San Francisco, Europe and more. Entrance Ticket to the travel sale is P100/ person. Get 50% off on entrance ticket to the Travel Sale Fair by presenting your locally issued Citibank credit card and a valid government issued ID upon ticket purchase. Limited 1 ticket per credit card holder. Are you excited? 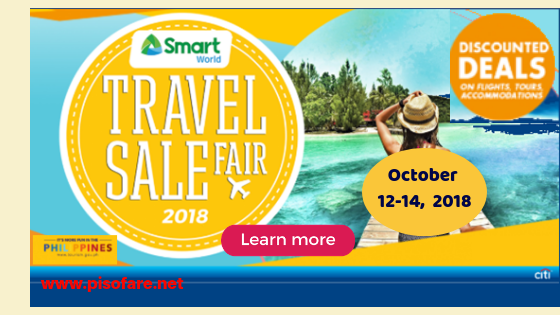 Then, head on to the Smart Travel Sale 2018 on October 12-14, 2018! Who knows we might bump into each other? For more discounted travel packages, airline promo fares, hotel accommodation promos and other travel deals, Like us in Facebook: PISO FARE TICKET!